Posted June 22, 2017 in Clinical Care by Gerald A. Beathard, M.D., Ph.D., FACP, FCPA, FASN, FASDIN. Marked changes have occurred in the vascular access profile of hemodialysis patients in the United States over the past 15 years. Although an excessive number of central venous catheters continue to be used, the predominant arteriovenous access has changed from primarily arteriovenous grafts (AVGs) to primarily arteriovenous fistulas (AVFs). There has been a considerable growth in the frequency with which dialysis access maintenance and salvage procedures are being performed. More than two thirds of these procedures are being performed in the outpatient setting, a large portion of which are freestanding dialysis access centers. Additionally, interventional nephrologists are performing a significant number of these procedures, primarily in freestanding dedicated centers. In order to determine how these changes have affected dialysis access maintenance and salvage procedures, all of these types of procedures performed at Lifeline Vascular Access dialysis access centers (DACs) were analyzed. During the period of 2001 to 2015, the number of Lifeline DACs increased from 4 to 77 and 689,676 dialysis access procedures were performed. The case mix shifted from primarily AVGs (83.18 percent of the group) in 2001 to primarily AVFs (63.32 percent of the group) in 2015. The arteriovenous procedure profile changed from one characterized by approximately equal numbers of angioplasties and thrombectomies performed on AVGs to one characterized primarily by angioplasties performed on AVFs. Interventional procedures did not decrease with increasing AVF utilization in prevalent dialysis patients as had been anticipated. Their incidence roughly paralleled the increasing prevalence of this type of access and were mostly angioplasties. As was expected, a decreasing percentage of AVG utilization resulted in a progressive decrease in the percentage of AVG procedures. This decrease was roughly parallel to the changes in AVG use, but was disproportionately higher. A progressive improvement in procedure outcomes and a decrease in complication rates and procedure times was observed over the 15-year period. A progressive decrease in tunneled dialysis catheter placement was primarily due to this procedure shifting to the hospital environment. Read the abstract on the study here in the Clinical Journal of the American Society of Nephrology. Gerald A. Beathard, MD, received his MD and PhD from the University of Texas Medical Branch (UTMB) in Galveston, Texas. He is board certified in internal medicine, nephrology, pathology and allergy and clinical immunology. Dr. Beathard taught nephrology and pathology at UTMB from 1968 until 1977 and continues to be a member of the clinical faculty at that institution. He was in private practice (nephrology and pathology) from 1977 until 2000. From 2000 until 2017, Dr Beathard was a vice president of Lifeline Vascular Access and is currently a part-time employee of that group. 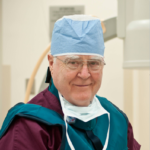 Dr. Beathard has been involved with endovascular procedures performed for dialysis vascular access maintenance since 1985. He has published 112 articles in peer reviewed medical journals, wrote on 12 topics for UpToDate, and has authored 56 book chapters and 12 monographs. Dr. Beathard is a fellow of the American College of Physicians, the College of American Pathologists, the American Society of Nephrology and the American Society of Diagnostic and Interventional Nephrology.